On Thanksgiving Day, we (myself, Kevin, and our friend) found ourselves in what many consider to be the “food capital of Italy.” Happy Thanksgiving to us. 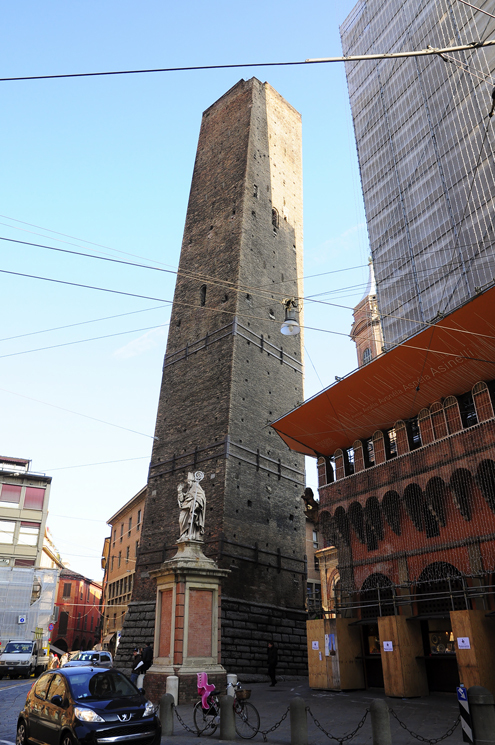 Bologna is the capital city of the rich, food-producing region of Emilia-Romagna. 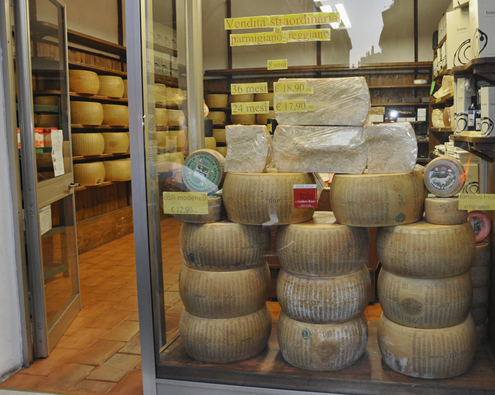 In addition to its famous Bolognese sauce, lasagna, tortellini, balsamic vinegar, prosciutto, mortadella, and Parmigiano-Reggiano (my favorite cheese) are some of the foods that originated in this region. You must try everything. This city is definitely a foodie destination which makes it all the more difficult to leave here feeling slim. 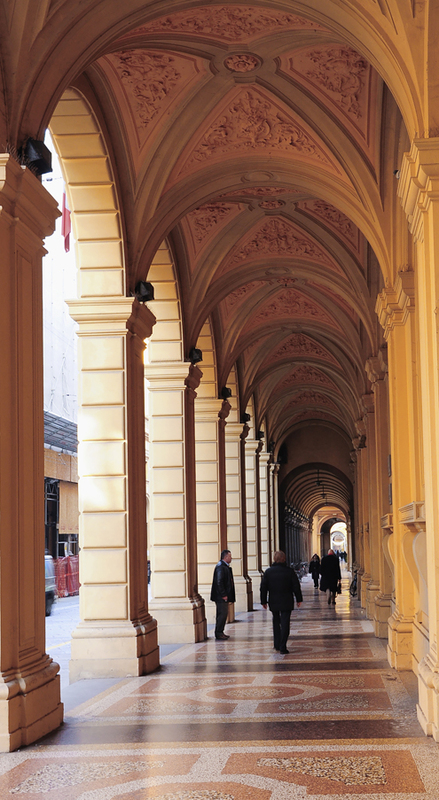 Bologna-famous for its porticos (arcades). 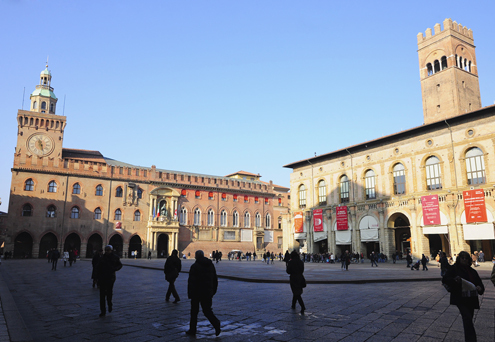 Besides the food, Bologna is also known for its miles of porticos (arcades), its striking medieval architecture, and as the home of the oldest university in the Western world—The University of Bologna, founded in 1088. Now that’s old. 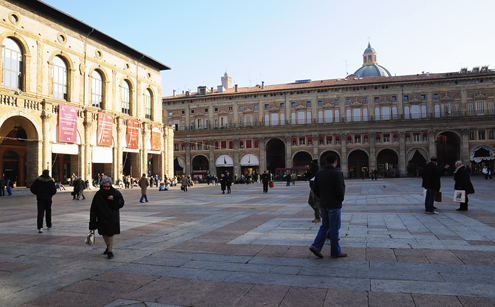 Piazza Maggiore is the main square in Bologna and considered the heart of the city. 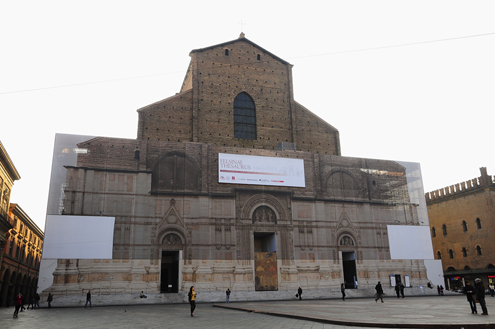 It is lined with Gothic and Romanesque style buildings, including the Basilica of Saint Petronio (Basilica di San Petronio). Dedicated to the city’s patron saint, the Basilica of Saint Petronio is the fifth largest in the world. Construction began around 1390 and continued for several centuries, but the façade remains unfinished (hence, the scaffolding). 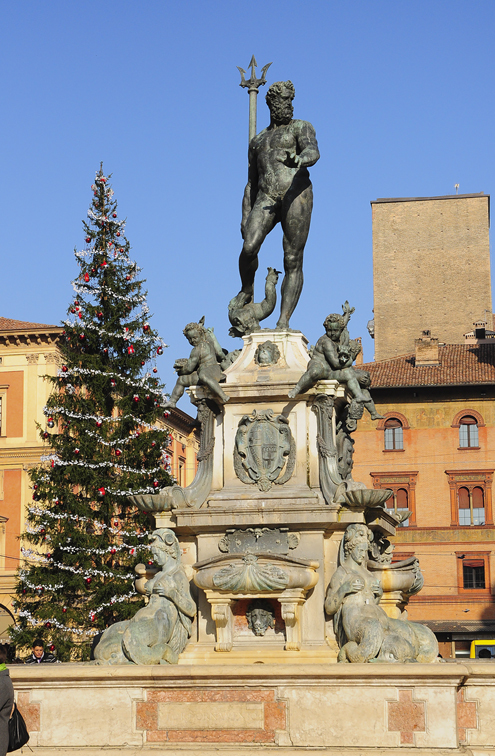 Located in Piazza Nettuno is the impressive Fountain of Neptune (Fontana di Nettuno). 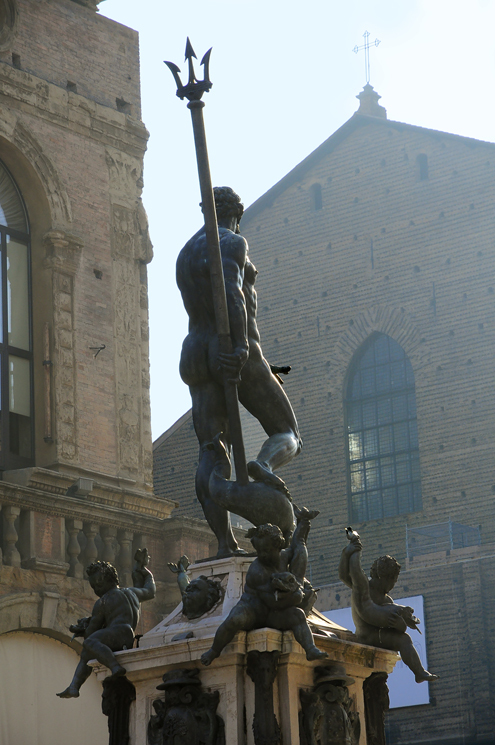 Sculpted by Giambologna and completed in the mid-1560s, the bronze, muscled figure of Neptune (god of water and sea in Roman mythology) stands high above his lactating nymphs. 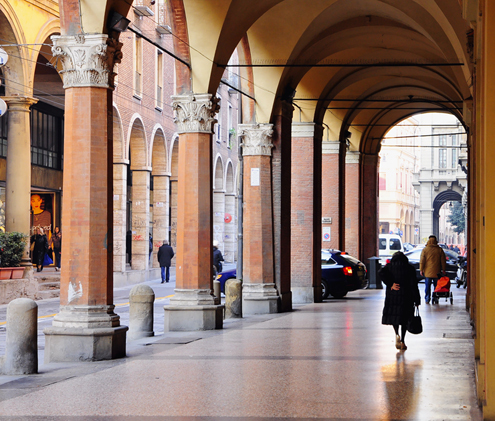 Bologna is a beautiful city that does not seem to be overrun by tourists…yet. It was nice to be surrounded by local people and their beautiful language. We enjoyed spending our Thanksgiving holiday here and hope to return to this region of Italy at some point in the future. Grazie mille, Bologna! 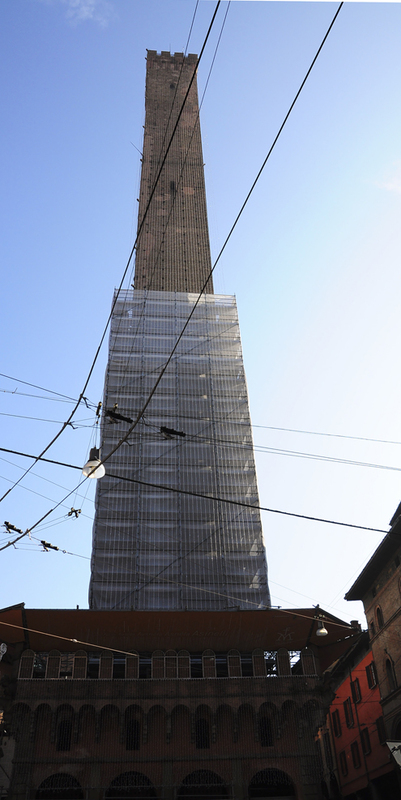 This entry was posted in Italy and tagged Bologna, Italy, photography, travel. Bookmark the permalink. Thanks for the great photos of one of my favourite cities in Italy. Did you climb the tower? Have fun in Milan. Thanks, Debra! I’m glad you enjoyed the photos. Bologna is a great city. Sorry, just rear it was closed. You will have to go back another time.